A special carcass construction ensures that the V64+ is extremely durable and stands up very well to penetration by thorns or stones. Its special tread and rounded shoulders ensure limited damage to turf areas and offer superb stability. Durable, extra thick tread design ensures reduced rutting and lengthens tyre life. 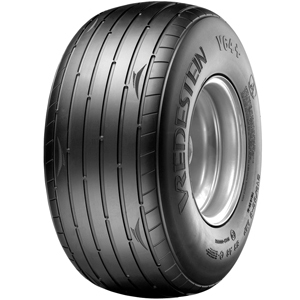 Outstanding tyre height/width ratio ensures maximum stability on and off the road. Rounded shoulders prevent damage to turf and sensitive crops.